Wanted: Knowledge Assets – Dead or Alive? There have been a few threads on LinkedIn KM groups on the topic of “knowledge assets” recently. Now I’m not going to assert definitions here – rather to give my view on the different perspectives, and share the way I distinguish between knowledge assets and information assets, building on the descriptions that Geoff and I wrote in “Learning to Fly”. 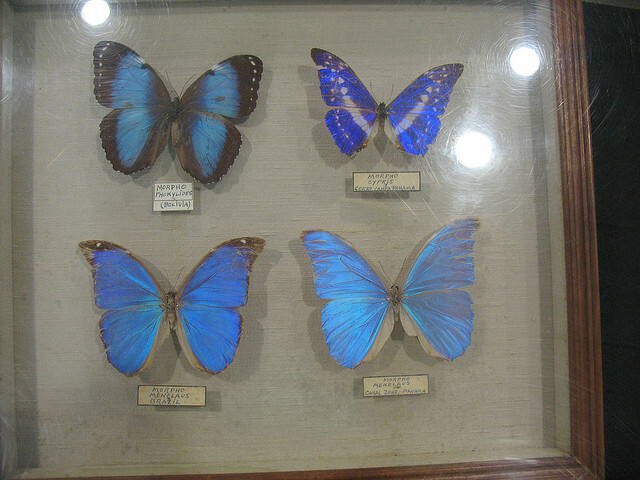 Speaking of flight, there’s something about butterfly collections which always leaves me feeling slightly saddened. The colours and fragility are still there, but of course the life has gone. I think we do well to remind ourselves that when we capture knowledge and write it down as information, we kill it. That’s not to say that the information is not immensely valuable, and may even have a long shelf life. Knowledge is information with the life still in it! For me, the role of a knowledge asset is to consolidate the learning from a number of activities, and produce a distilled set of guidelines or recommendations, with (importantly) a clear and well-linked signpost to contact the source, to drill down into more detail and examples, and to contribute further stories to build the asset further. Oh, and there’s some kind of mechanism for validating the input – ideally via a community of practice. They keep it alive. There is an “extractionist” school of thought out there which focuses on separating knowledge from an individual, then combining, distilling and packaging in into a convenient and accessible products. And there’s a “connectivist” school of thought which seeks to turn information into an advertisement for a conversation with the source. I think the best knowledge assets combine these perspectives. Too much extractionism (is that a real word? ), and you can end up a logical but inflexible, self-reinforcing summary of the views of the editor-in-chief. Too much connectivism, and you can get endless repeating, diverging threads and snippets which can be frustrating to draw insight from, and require too many phone calls to answer the all questions they elicit. There are some topics which lend themselves to something approaching a “single version of the truth” (we call that known area “best practice” don’t we? ), and for them, the logic of an extractionist-oriented knowledge asset will work. Then there are topics which are more complicated, and benefit from the constant iteration and interaction of a connection-rich asset. 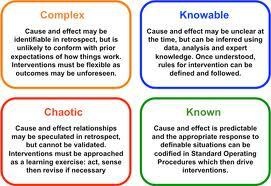 (That’s knowable “good practice” in the Cynefin framework). I suspect it’s in these two quadrants where knowledge assets add value. Shifting further to the left takes us on a journey into emergence and chaos where pre-packaged knowledge is unlikely to fit the bill, although the fragments and stories they contain may well be informative. … a cookbook isn’t really a very good example of a knowledge asset because it represents a snapshot in time of a particular recipe, and doesn’t usually provide me with an easy way to ask questions of the chef, or other cooks who are learning/experimenting/adapting… I would say it’s really an Information Asset. That’s not a bad thing – I have a kitchen full of them! However, a recipe *blog*, which has all the benefit of the book, but which is socially constructed, grows and develops, commented-on added to by other cooks and enthusiasts who ask and answer questions… Now that feels more like a *knowledge* asset to me. Well said! And could not be said other way. Thank you! Fascinating post, Chris. I would be interested in your take on those involved in online curation (e.g. Brain Pickings, Curiosity Counts, Open Culture, etc). It seems that where they do this well, there is an element of both ‘extraction’ and ‘connection’. And where knowledge/information has been separated from an individual or its original context – possibly through the death of an individual, for example – these curators are seeking to inject new life by prompting ongoing discussion. Or am I way off track on that? …then I agree with you – it’s all very closely related. I guess the areas where knowledge assets might be different is that they are usually restricted to areas which have some longevity (i.e. several years?) because they strategic topics to a company, and tend to be built upon over long period. The other difference is that perhaps knowledge assets place a greater emphasis on including and promoting links to the people behind the content. But overall, yes, sounds like a very similar practice. Thanks for teaching me something new! There is also a good post on content curation by Beth Kanter: http://www.bethkanter.org/content-curation-101/. This is also an area that Brian Solis has written about on his blog (e.g. http://www.briansolis.com/2011/04/the-curation-economy-and-the-three-3c’s-of-information-commerce/) and in his recent book. …even tips and tricks based on experience which are very valuable in how things are done around here are still “information” (or more precise “informal information”…but I’m happy to call it explicit knowledge…because for me knowledge is personal, it’s the fundamental skills you have to deal with a situation you perhaps have never dealt with before…this becomes obvious in the difference between a chef and someone who follows a recipe, where they may become stuck if something is missing or something changes where they don’t know how to adapt…this (know-how) you can’t extract (more for observation and apprenticeship)…but the connectivist you talk about is the next best thing to have dialogue and re-frame to your context, so you can then action it where it becomes personal knowledge. Therefore knowledge flow (connection) is key to problem solving in life. …so the best we can ever do is create conditions for dialogue, which documentation doesn’t have, and from this we can act. We achieve this by allowing people to connect; knowledge flow. Once we have this then we can do knowledge management. By that I mean we can do the “manage” part by gardening, curating. ie. using links in documentation (processes, procedures, guides, etc.) that point to the threads from the knowledge flow. Our documentation is perpetually evolving; which is what KM is. I think you and I read the same papers 🙂 Love the butterly analogy..
You’re right. Liked your presentation.